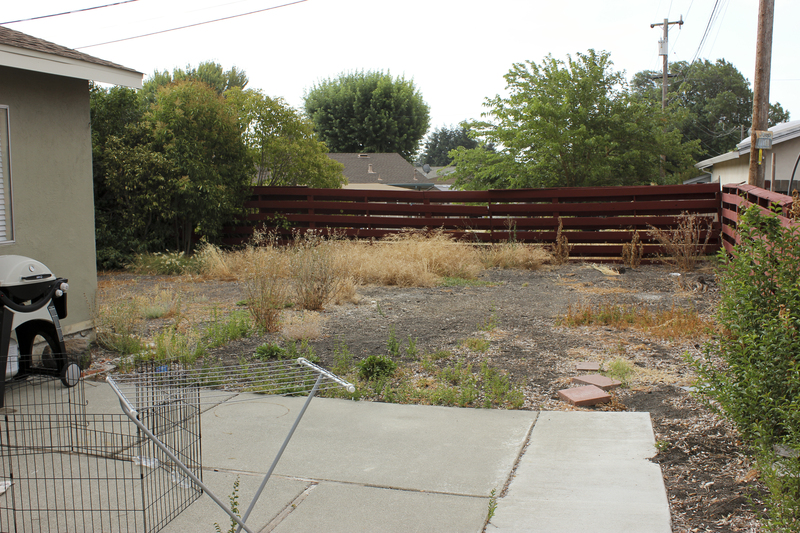 And for a deviation from my most recent posts on mommyhood, here’s an update on our backyard! For the past year and a half, we’ve wanted to do something with our backyard but haven’t gotten much further than the occasional weeding. Man, those weeds get OUT OF CONTROL quickly! 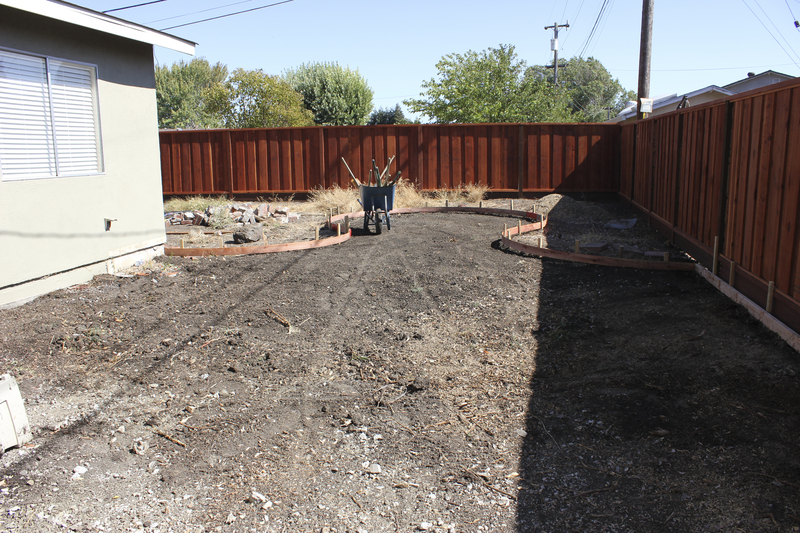 People kept asking us, “Any progress in the backyard?” and unfortunately, we had nothing to report until now. I honestly wasn’t that bothered by our backyard until we got our puppy Zoe. Now that Zoe’s here, I’m in the backyard multiple times a day to let her out to go to the bathroom and I had to face the reality of what our backyard looked like and it wasn’t pretty. We were already planning to replace our fence and work on the backyard this summer but being in the backyard every day really lit a fire under our toosh. Not to mention, we want it to be a fun play area for Zoe (and Claire! when she’s old enough) and it wasn’t so fun. I can now proudly report that we have a new fence and it’s beautiful!! It feels like we have a real backyard now and I love how much more private it is. And, we finally have a new patio too. You have no idea how exciting this is to me. When the fence was finished, I squealed in excitement. No joke. Isn’t it amazing what you get excited about when you become a homeowner? My teenage self would have rolled my eyes at my reaction. 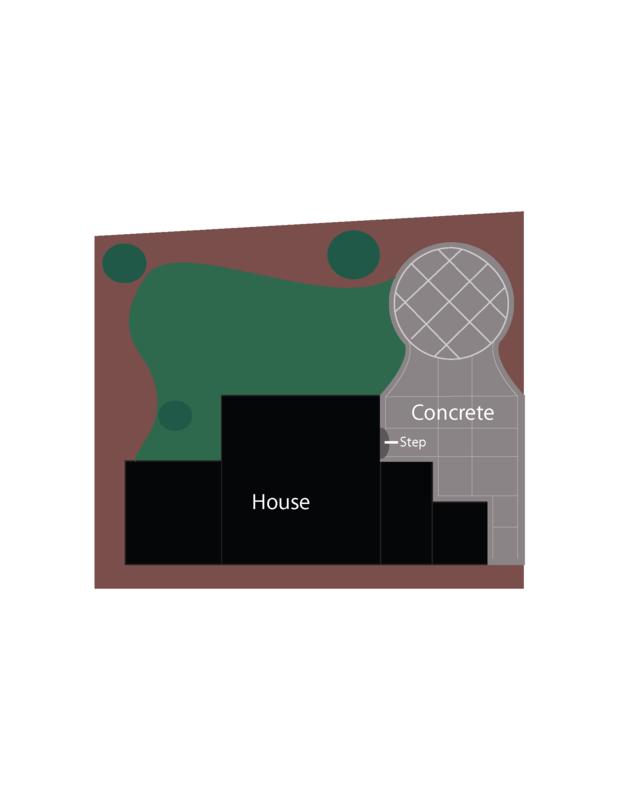 We have a very general plan for how we want our backyard to be but we’ll iron out the specifics as we go along. Right now, we are planning to have a table and grill on the main patio area. The circular area is going to have a firepit and chairs. At first, we were going to do a built-in firepit but then we decided it would be best to get a movable one so if we have parties (maybe Claire’s first birthday?? ), we can put the firepit away and add an extra table in that area for people to eat and relax. We’ll see! We also want a grassy area and some nice plants. CJ is also thinking about making the table for the back patio and I’m sooooo excited for that!! It’s going to be beautiful. That’s pretty much all we have planned for now. Our very very rough idea of what we want. It’s not really to scale but you can tell that we have plenty of space to work with. Ignore the step, we decided against adding one as the new patio will be raised higher than the old one. We did get a plan made by a landscape designer last year but it’s kind of gone out the window due to the drought. The plants in that design are not drought resistant and we’d rather not use much more water than we are right now. Here are a few before and “current state” photos. I won’t say after since it’s a work in progress but holy moly is it a huge difference!! The concrete was ripped out and then they did the framing of the shape of the patio. 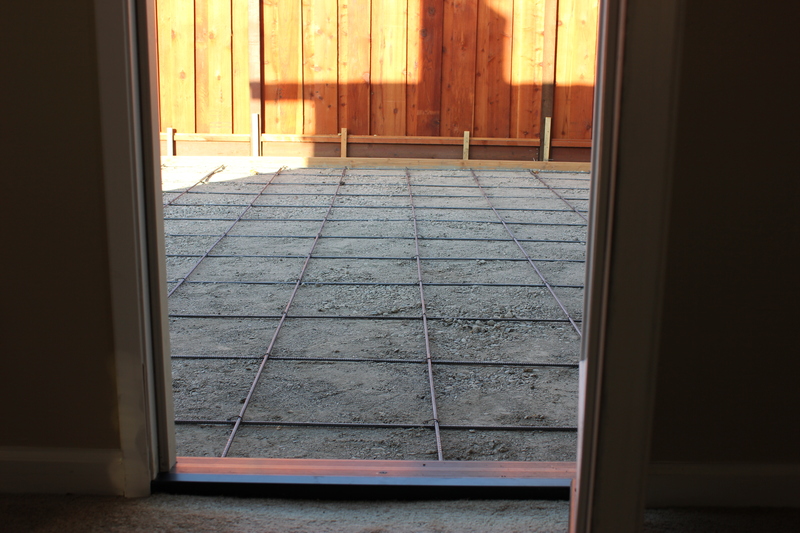 We then had rebar laid inside of the framing. 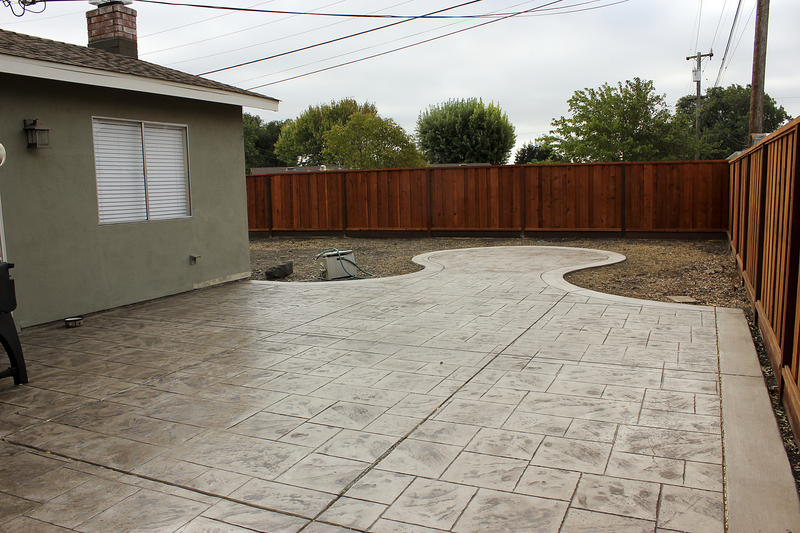 And then the beautiful concrete was laid and stamped! The new patio is higher up which means there’s less of a drop from the back door onto the patio. It’s so much better for us and will be for little Claire when she starts walking. Zoe likes having less of a jump now too. The above photo is what our backyard looked like today! What a world of difference a new fence and patio can make. You can’t tell from the photo but our backyard is sort of a u-shape (you can see that in the drawing I did above) so we have a lot more backyard to work with still. We actually enjoy going in the backyard now though! And the new patio is so much bigger which makes the yard feel bigger because we can now take more advantage of the space we have. Stay tuned for more updates! We’ll be taking the backyard in stages but we’ll keep you updated along the way.